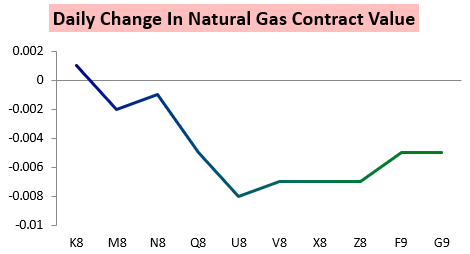 Natural gas prices started strong right out of the gate today, with the May contract rallying to the $2.79 level before reversing and settling just a single tick up on the day. 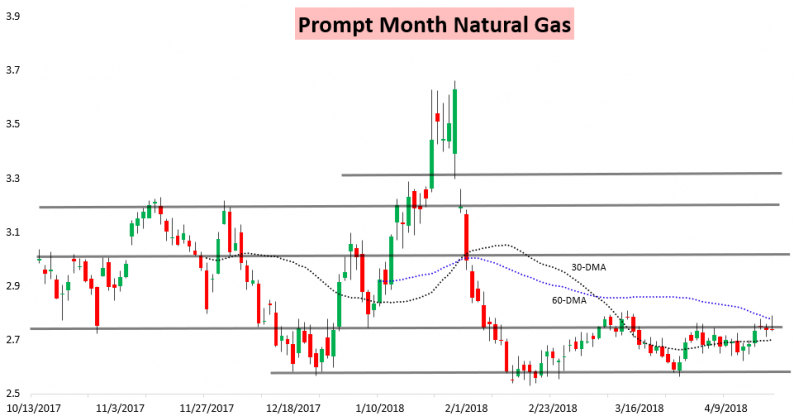 This fit in perfectly with our expectations, as in our Morning Text Message Alert sent to clients early this morning we highlighted that any morning bounce in natural gas prices should fail. In our Morning Update we highlighted our slightly bearish sentiment for the day even though we saw potential for prices to bounce to $2.78 on firm cash. Then as prices topped we explained why we continued to see a tight ceiling for prices in our Note of the Day. 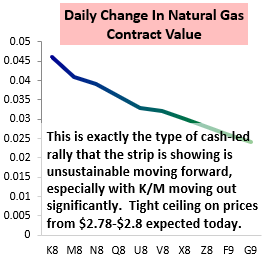 Natural gas curve structure today made it abundantly clear all day that the rally was cash-led, with later contracts pulling the May contract lower. We ended up with larger losses further out along the strip as well. The result was a sizable tick up in the K/V spread today even as the May contract (K) was flat. 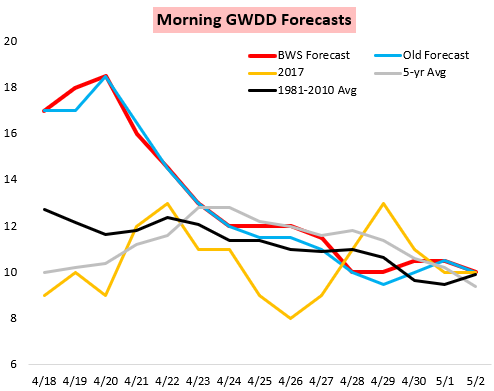 Weather did little for prices today, with slightly colder overnight short-term trends potentially helping support cash prices more this morning but otherwise day-over-day GWDD changes just slightly positive. 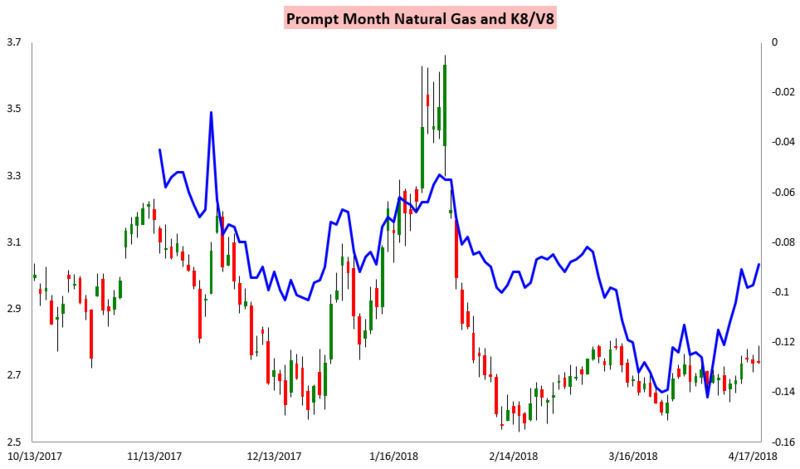 Cold weather elevating cash prices has certainly played a role in elevating K/M (and K/V as well), but we see that the October/January V/F spread has been more stable through some of the recent front-month spread narrowing, seemingly tuning out the shorter-term weather-driven noise. 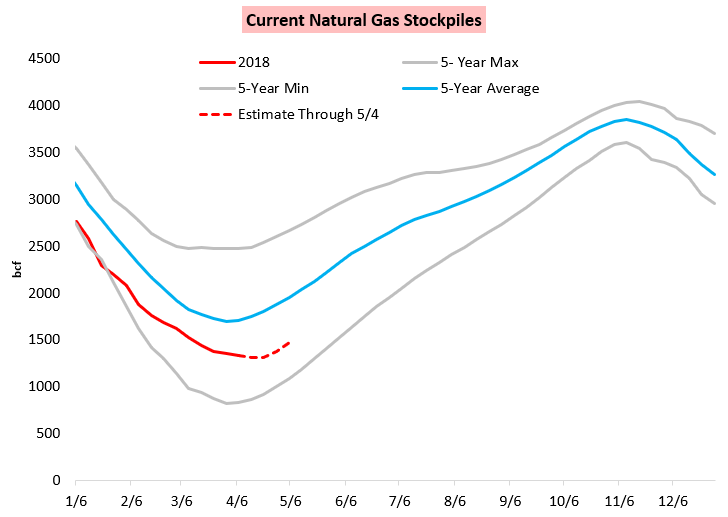 As we explained in our Afternoon Update this has ramifications for expected future natural gas prices risks moving into the end of the month, especially with our latest forward weather expectations. Tomorrow’s EIA print will certainly play an important role in directing prices into the end of the week as well; our estimate of -23 bcf appears to be generally near the market consensus, though a few analysts are clustered closer to -30 bcf. Tomorrow morning we will break down our expectations of price action before and immediately after the EIA print release, analyzing balance for clients and seeing how it fits with our current analysis. We will blend in our latest weather expectations and spread analysis to determine price risk into the end of the week, providing an integrated approach to natural gas analytics.